Woolfoot Heating is a heating contractor part of the Worcester Bosch Group based in the Pool in Wharfedale area. EJ Woolfoot Ltd evolved from a small family run business into an expanded team to compete with the leading national heating companies in the UK. Since 1968 Woolfoot Heating has delivered outstanding service with a team of expert engineers across Yorkshire. 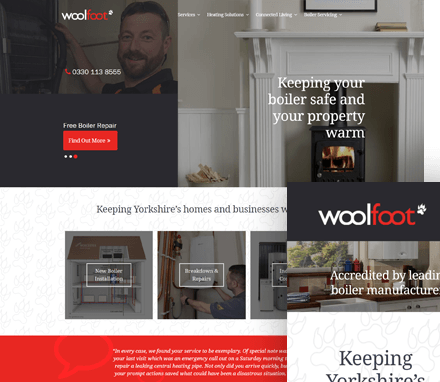 Woolfoot Heating needed a new website that created awareness of the brand, presented company information and their various services and contact information. Using our Growing Package, we included detailed sections of the site dedicated to the company’s background, team and services as well as other useful information at the bottom of the site – this is also customisation of the initial template. We recently took Ascensor on to revamp our website and what a fantastic job they have done! The website is excellent and it was a seamless transition from our previous supplier. His staff are always willing to take calls and deal with other agencies and also help out with some things that are not necessarily within their remit. Thank you Andrew - Keep up the good work!